I was ecstatic when I received a Lush present from Candy for Christmas. 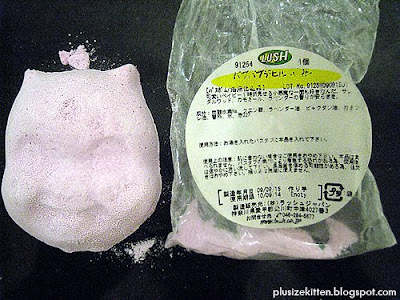 She bought this limited edition Lush bath ballistic "Ickle Baby Devil" from her trip to Japan for me. On first look this item looks really horrible/scary to me especially with the grin and horns on it. It seems to be crumbling so I had to use it asap. The description says it's a children bath bomb and that would be great for sensitive skin too since it's made to be delicate for children to use. The scent is chamomile/lavender-ish and is pink in color. Under running bath water in my bathtub, I dropped the Ickle Baby Devil in and it fizzes away like a devil being splash with holy water. Very good "distraction" for parents trying to make their kids go to bath! The bath water turns slight pink and there's a slight smell of what's left of the bath bomb. I wish the scent was stronger. I didn't feel that it lives up to its description (soothing sleepy bath). Probably it's really meant for children to have the effect? I need something more aromatic to make me go into a dreamy state. Till my next bath ballistic! Ickle Baby Baff And now there are two! They smell the same as our previous wonder bath to get children to sleep, but now one is blue and one is pink. 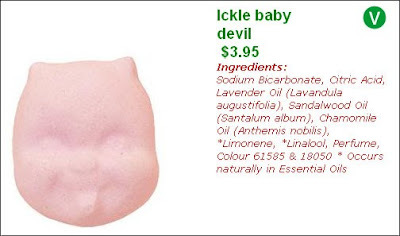 The Ickle Baby Devil Bath is pink; it's for kinds who are devilishly difficult to get to sleep. Sooth their tantrums with a fizzy, mood calming Bath Ballistic. The Ickle Baby Angel Bath is blue; its for kids who deserve a treat for behaving well. Make sure they stay calm all the way to bed with a fizzing, soothing sleepy-time bath. Your kids can choose the colour they prefer; we wouldn't be so assumptive as to assign them to boys or girls. It's bigger too, so it lasts longer and wafts out more mind-calming essential oils to prepare the little 'uns for a good night's sleep. One thing we won't change is its magical powers! Fiz! is Lush cheaper in Jakarta??? is the shop big there? yea.. our scent kaput-ing as we grow older..sad sad..
fiz: i'm so in lush mode atm.. i'm goin to visit lush jakarta website now.. n dream..
oh and the baby face looks really scary and evil! haha.